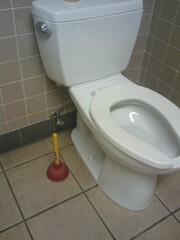 Look how small this plunger is?! * Going into battle with a poop that’s big enough to clog a toilet is like sending Christians to fight lions in the colusseum. * More like a plungette. * If you’re using a plunger this size, you might as well just go in with your hands. * Like throwing a hot dog in the grand canyon. Those aren’t great, feel free to improve if you’ve got a better caption.